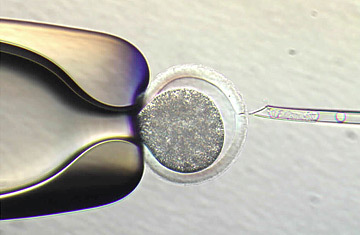 A holding pipette, left, positions an unfertilized egg. After plodding along at a snail's pace over the past five years, stem-cell researchat least the scientific side of ittook a few bold steps forward Wednesday. As Congress gets set to vote on legislation that would expand federal funding for the field to include studies on excess IVF embryos, researchers in the U.S. and Japan announced exciting advances in their ability to turn back the clock on older, adult cells and get them to generate embryonic stem cells. The findings could expand the ways that doctors and patients eventually generate customized stem cells for treatments. The work, published in the journals Nature and Cell Stem Cell, represent true milestones, not only in the field of stem-cell research, but in the broader discipline of early biological development. Led by Shinya Yamanaka at Kyoto University, one group successfully coaxed a mouse skin cell to reverse its development and return to an embryonic stage at which it produced stem cells. Two other groups, based at Harvard Stem Cell Institute (HSCI) and the Whitehead Institute for Biomedical Research at MIT, obtained similar results working independently. In the final paper, Kevin Eggan, also at HSCI, showed that even fertilized mouse zygotes at the one-cell stage can be reprogrammed to generate stem cells. Previously, biologists had believed that once fertilized embryos embarked on the developmental path, they could not be manipulated to produce stem cells. So how does all this science affect the millions of patients banking on the promise of stem-cell therapies? Each of the investigators stress that their results, while exciting, have not yet been tested with human cells, although those studies are already under way. But the basic principles involved in generating stem cells in mice and man are the same, and with a few modifications, the scientists hope to have similar success with human cells. "It's likely to be the case that since this discovery is based on such fundamental cell biology principles, that the overarching rules [for mouse and human cells] are the same," says Eggan. "There are subtleties in human embryology that make human development different, but it should work." If it is indeed possible to take a skin cell from an adult patient and tweak it to revert to an embryonic-type cell, that would mean that any patient needing a stem-cell-based treatment could, in theory, heal himself. Last year, Yamanaka was the first to announce success with this approach, by exposing the cells to four growth factors and nutrients. But the stem cells he generated were genetically abnormal and unstable. Building on the initial technique, Yamanaka's group, as well as those led by Rudolph Jaenisch at Whitehead and Konrad Hochedlinger at HSCI, showed that the process does indeed workand can generate stable stem cells that go on to develop into eggs and sperm that can produce healthy mice. "It's very exciting and we look forward to all there is to do from here," says Dr. Renée Reijo Pera, director of Stanford University's Institute for Stem Cell Biology and Regenerative Medicine. One immediate obstacle to translating the results to human cells involves the way that the scientists turned back time on the mouse skin cells. They used a retrovirus vector, piggybacking the genes for the growth factors and proteins onto this infectious ferry. Retroviruses, however, like HIV, can cause infectious diseases and are not always easy to control, so before testing this approach in humans, researchers need to find other modes of transport for the critical compounds. The good news is that they need the genes to churn out their proteins for a only brief period of time, so using less virulent viruses, such as the adenovirus (responsible for the common cold) or simply saturating the cell with growth factors and nutrients directly may work. "Technically, it should be possible to introduce genes or protein to reprogram cells," says Hochedlinger. The other concern is perhaps more dauntingtwo of the four factors that can turn back the clock on adult cells so efficiently are known to cause cancer. One, in fact, was the first gene discovered to cause cancer in mice. "Figuring out how to reprogram cells without directly exposing the cell to the cancer-causing effects of these genes is a major area of scientific activity, and would have to occur before we could consider using similar factor in humans," says Eggan. In the meantime, Eggan's group has provided an alternative method for generating customized stem cells that would take advantage of the early-stage embryos frozen in IVF centers around the country. The most reliable way of generating patient-specific stem cells remains nuclear transfertaking the nucleus from a patient's skin cell and inserting it into an egg that has had its nucleus removed. This hybrid then begins to divide, and within a few days, generates stem cells that are genetically identical to the patient. The problem, however, as Eggan puts it, is that "there are never any extra unfertilized eggs hanging out at IVF clinics." That's because unlike sperm, an egg cannot be frozen without destroying its integrity. Most clinics will fertilize every egg, and freeze them at various stages of development. Eggan's group has found, astonishingly, that one-celled zygotes, or fertilized embryos that are on the verge of making their first cell division, can act just like the emptied-out egg in the nuclear transfer process. And because more of these zygotes are available than eggs, it may give patients another way of obtaining customized stem cells. In fact, notes Eggan, there may be even more such zygotes available if you count the abnormally fertilized embryos that IVF clinicians discard immediately. Anywhere from 3% to 10% of IVF embryos get either too many or too few chromosomes when they are fertilized; these embryos have no chance of survival and would never be transplanted into a IVF patient. Other than their abnormal chromosome count, however, they are perfectly normal, and Eggan has proven that with mouse cells"we removed the abnormal set of chromosomes in a one-celled embryo, replaced it with a normal set of chromosomes from a donor cell, and showed that those reconstructed embryos can be used to generate embryonic stem cell lines," he says. "It can work." And that's what has stem cell researchers excited again. While these findings do not address perhaps the thorniest aspect of embryonic stem cell researchthe controversy over the ethics of experimenting and manipulating embryos they do highlight how little we know about stem cells and early development, and how powerful that knowledge can be, once we attain it.